The 1190SX is right in the thick of things with Kawasaki, Suzuki, and Yamaha. The CBR is surprisingly underpowered, especially when compared to the 180ish ouptut of the two Euro contenders, Aprilia and BMW. 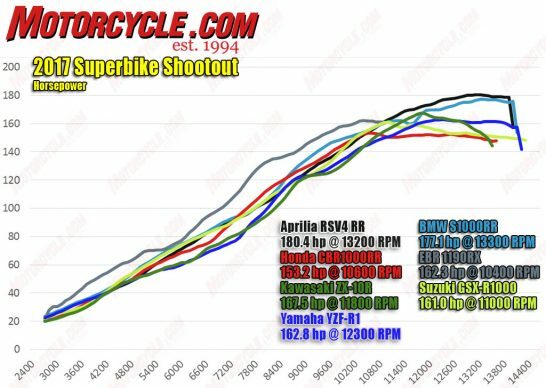 Note how the power of the CBR (after being the highest-output four-cylinder in the 7000-8000 range) flattens out after 10k rpm, followed soon after by the ZX, GSX-R and R1, so that they are able to pass the EPA’s noise-emissions regulations by partially closing throttle plates at high rpm. It appears once again that the Euro bikes are unaffected.